40mm m781 | MAST TECHNOLOGY INC.
A practice round—used in grenade launchers such as the M79, M203 and M320 — with a powder-dye filled projectile that marks the point of impact during training. Function: The M781 is a training round to be used in the M203 or M79 40mm grenade launchers. It is designed to train soldiers to fire the M433 Low Velocity HEDP round. Upon impact of the 40mm M781, a signal (cloud) is seen from yellow-orange powder dye. Configuration: 25 40mm M781 rounds per cardboard box, 4 cardboard boxes per wire-bound box, and (typically) 20 wire-bound boxes per pallet. Body: White Plastic Base (M212), Zinc Single-cavity Cast, Blue Plastic Nose Cone. The majority of the projectile’s weight is from a zinc part. 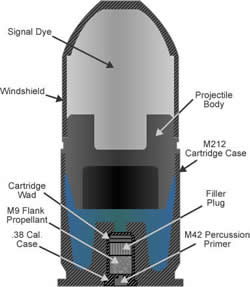 The propellant charge is contained within a 38 S&W case inserted into base case (M212). MAST’s 40mm M781 product has the best standard deviation in the industry.